Bottle gourd recipe collection. Indian lauki recipes. dudhi recipes. Yes, bottle gourd is that seemingly simple but awesome veggie that you buy every other week. Large and longish, green coloured on the outside and a soft white inside, this humble gourd is nothing short of a culinary super star. Also known as lauki or bottle gourd, this vegetable is available all over India and is popular in most cuisines. Having a neutral flavour and soft texture, it lends itself to a variety of foods, ranging from juice and soup to dessert too. This superb veggie, which can be worked into parathas and subzis effortlessly, is also very healthy. So you can comfortably include it in your daily diet without a second thought unless specifically told by your physician not to. Dudhi is being added to Indian subzis since a very long time now. Even though dudhi seems like a boring vegetable to work with, it can actually get quite interesting. Bharwa Lauki is one such rajasthani recipe that will make your mouth water! Here, the dudhi is stuffed with paneer and nuts and served in a tangy tomato gravy. Other amazing dudhi subzis are Lauki Kofta Curry and Dhansak Dal. When cooked, doodhi becomes very soft and mushy which makes it ideal for soups. The vegetable can be combined with different vegetables to make a variety of soups. Bottle Gourd and Onion Soup is a delicious soup which is flavored with onions, potatoes and white sauce. If you want to add more flavor to this, you can add carrots which provide a very subtle sweetness. Not only is doodhi eaten as a suzi for main course but it is also eaten in a dish for breakfast. Saatdhan parathas are made with 7 types of flours. These parathas may sound very boring but they are made with doodhi and gajar in the dough itself and are ideal for a good start to the day. Grated lauki can also be added to a besan batter to make flavorful Lauki Chillas. When you are buying doodhi from the market, pick ones that have a smooth skin, are pale green in colour and free of cuts, spots and blemishes. The doodhi should be firm to handle and the flesh should not feel soft when pressed. Bottle gourd cooks very fast and has a mellow flavour, which makes it popular all over the world. As it combines awesomely with dal and spices, it is used frequently in Indian cooking too, both in everyday food and special dishes. Doodhi (bottle gourd, lauki) : With extremely low levels of sodium, this doodhi is highly suitable for those with high BP. It helps reduce blood cholesterol levels and regulate blood pressure and ensures a proper blood flow to heart and they're onwards to all parts of the body. It helps prevent acidity and good for diabetics. See the 10 benefits of bottlegourd article for complete information. 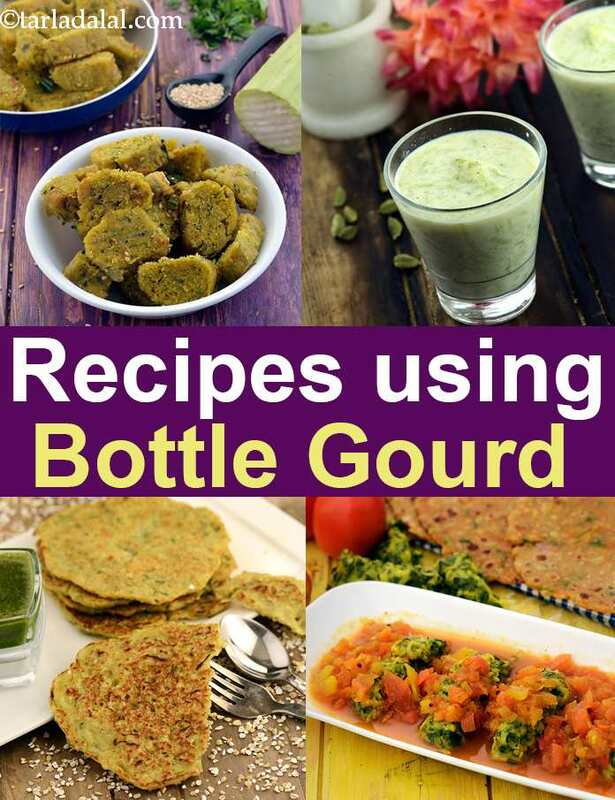 Enjoy our bottle gourd recipe collection. Indian lauki recipes. dudhi recipes given below.